Lord Jonathon Beckett's mission is simple: retrieve Lady Hannah and place her under the protection of the Crown. But he isn't prepared for the havoc she inflicts on his world, making him question whether his duty as an agent of the Crown should always come before his heart. I enjoyed the first book in The Beckett Files series and was excited for the opportunity to read A Peculiar Courtship. I'm not sure why, but I was somewhat hesitant to start this book when it came. Maybe the cover didn't call to me. Anyway, whatever the reason, when I did start I was drawn in by Hannah's situation. There were some exciting and suspenseful times. The first part of the book was fairly intense with Hannah's rescue. Then there was a lull for quite awhile that mostly focused on Hannah and Jonathon falling for each other and then miscommunicating so that they didn't know where each other stood (this happened more than once). It took me quite awhile to get through this portion of the story, but things picked up again near the end as the evidence was found to incriminate and catch the bad guy. There's a handful of swearing throughout the book (which is always a turn off for me) that didn't fit the time period. I think that was perhaps my hangup with the book. It didn't consistently feel like a Regency romance. Some aspects or mannerisms just felt too modern. In addition to the profanity, there is passionate kissing and violence. This book is a quick read that matches well with the first book in the series. That being said, it can be read as a stand alone book since everything important is explained again. I do enjoy that this author creates strong female characters. Here's one of my hang-ups with this book. Killing someone is treated like it's nothing, even though that was the big problem in the first book (worry for Eliza's soul after she killed a whole lot of people). But their solution to every problem is "Just let me kill so and so." Then they decide that that isn't the best idea for one reason or another...mostly that they need more information from the person, which they can't give if they are dead. However, they always always always end up killing them. Then it's like "Oops, didn't mean to do that. Oh well." Another hang-up is that I feel like Hannah's and Jonathon's relationship is more lustly than love. They don't understand one another, but they are attracted to each other and that seems to be good enough reason to get married. I read it quickly, and my attention was kept the entire time, I was just bothered by the attitudes of the characters to really recommend this book. For some reason, I was thinking that this story was a continuation of Eliza and Benedict, so I felt so lost for the first few chapters while I tried to place Hannah in Eliza's place. But once I figured out this story was about different people, it went a lot smoother. Jonathan was not my favorite person. In fact, he was kind of a clueless jerk. Very sweet to Hannah one minute, and the next, completely overbearing. Forbidding her to do things that she clearly wanted to do, then acting all bewildered that she didn't just sit back and let him take care of her. It took me a long (very long) while to warm up to Jonathan at all. Hannah was enjoyable to get to know. I like how she made up her mind to learn something new and kept at it so she could protect herself instead of waiting for someone to do it for her. 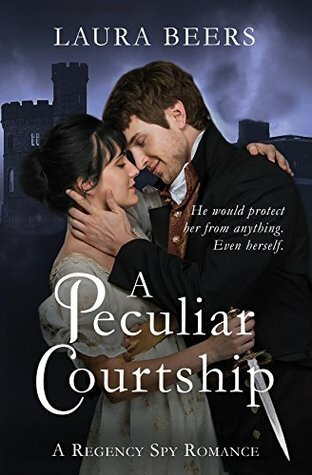 This book reads more like a contemporary novel rather than a Regency, so if you like traditional Regency stories, you won't get that with this book.